See more objects with the tag travel, graphic design, advertisement, poster. See more objects with the color darkslategrey gainsboro saddlebrown darkslategrey goldenrod or see all the colors for this object. This is a Poster. It was designed by Edward McKnight Kauffer and made for (as the client) American Airlines. It is dated 1948 and we acquired it in 1963. Its medium is offset lithograph on paper, lined. It is a part of the Drawings, Prints, and Graphic Design department. Designer E. McKnight Kauffer produced a series of posters for American Airlines in the 1940s after returning to live in the United States, many of which reflect his modern and symbolic approach to design. 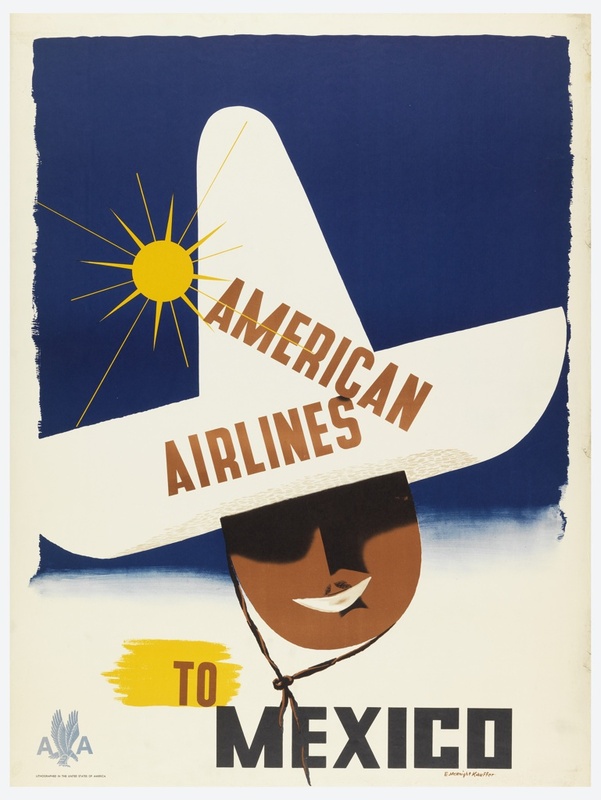 Although this poster emphasizes the sunny destination of Mexico rather than the experience of flying, the form of the figure in his sombrero subtly approximates an airplane, reminding travelers to choose American Airlines. This object was donated by Mrs. Edward McKnight Kauffer and catalogued by Virginia McBride and Kristina Parsons. It is credited Gift of Mrs. E. McKnight Kauffer.